I'd like to hang a mirror on the wall. It's 4ft high and weighs about 50lb. 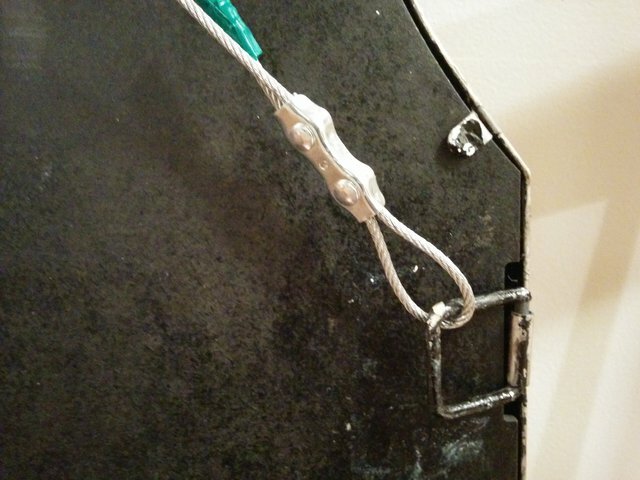 There are two hinges on either side of a metal frame. The width of the mirror is exactly 32". I found that studs in the wall in question are indeed 16" apart. What kind of bolt should I use? I'm guessing it must have a pretty large flange. Is it possible for the two hinges to be stowed away behind the mirror? Is it a good idea to look for a kind of bolt/contraption that keeps the hinges perpendicular to the mirror and slant the mirror slightly down? What kind of bolt would work for that? The studs in this area go down only from the ceiling to the middle of the wall, not to the floor. Should I worry that these are not suitable for a heavy object? I have no clue why my stud finder doesn't read anything from the middle of the wall down. The wall in question backs to the garage. Here is the result. I used clamps and a 1/8" wire. A thinner wire would have provided sufficient tensile strength, but I was uncomfortable with producing crimping that will last. I opted for clamps instead. In any case, remember that during cleaning the mirror will take a bit of shaking, and so some extra strength in the wire and clamps will provide peace of mind. 50lbs is definitely something drywall or plaster can handle, but absolutely go with using the studs. Just regular wood screws or decks screws are fine, 2" to 2 1/2" long maximum to avoid any unknown electrical or plumbing. You can also double the screws on top of each other for more security. Using the hinges or rings as they are will keep the mirror more vertical & tighter to the wall, but you have to very carefully level the screws based on the hinges or rings being under some amount load or weight. They may be out of level with each other or one may also be bent higher than the other. Using the hinges or rings as anchors for a hanging wire, which is their intended & normal use, will bring the top of the mirror out from the wall & pitch the viewing angle down a little. But you only need 1-pair of screws side by side in one stud & leveling is done by centering the wire on the screws. The short wall studs could indicate concrete, brick or cinder block construction halfway up the wall. The whole garage wall should read this way & was typically done to withstand slight car impacts. If it's just a 2 to 4' area then it could be the remnants of a fireplace or chimney. What do I use to mount a heavy framed mirror to a stud wall? How can I hang small weights from a drywall ceiling in a way that's minimally destructive? What is my wall made of and how should I hang a 50lb mirror?